I woke up and immediately looked out my porthole and saw the glaciers! I almost fell out of my top bunk, I was so excited to get dressed to go out and see it! I woke my roommate, "Irina, Irina, there's ice!!!" She joined in my excitement, and we dressed with many layers and headed out to the deck. I wanted to shout with excitement and almost did when I saw others out on deck experiencing the scenery! I took a few pictures, however it was still quite dark. The wind was also howling and it was tough to enjoy being out on deck. So, I resorted to going in and eating breakfast. 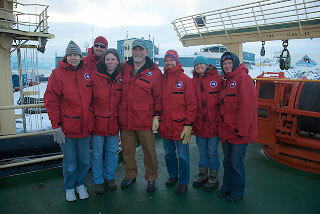 We arrived at Palmer Station at 8:00 a.m. promptly and snapped lots of pictures. I was really in awe - Antarctica. Absolutely amazing. The glaciers, the blue/azure color that I have always seen in my National Geographic magazines, I was experiencing first hand. Overwhelming and the cold was exhilarating. 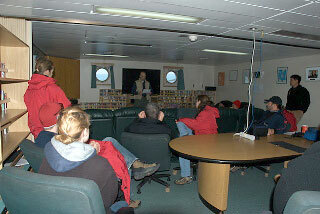 At 9:00 a.m., the Palmer Station Director came onboard and gave us some pointers about the station. My team will actually get the full orientation when we return on Wednesday since we are going straight back out tomorrow. The sun actually started to come out when we disembarked and took a tour of the buildings. The lab is amazing - a scientist's dream with every kind of glassware imaginable and the aquarium room for our fish is so cool! Flow through systems that are going to be fitted for our experiments. Dr. Sidell and Jody Beers worked on that, as Irina, Jeff, Dr. O'Brien, Dr. Crockett and I checked in our equipment and organized the lab. What a process! It is phenomenal to imagine the scientists' excitement, as you consider the time that has gone into the proposal process for getting their project approved, funded and organized and now it is here!